Washington Junior Closed – Congratulations to Michael Lee (1st Place), perfect score (5/5), seeds into the Washington Chess Championship in February; Ricky Selzler (2nd Place with 3/5); Kevin Binz (3rd Place with 2.5/5). Gonzaga University in Spokane was the site for 2006 WA Challenger's Cup, December 16-17. The highest finishing WA resident in the open section will be seeded into the state championship in February. Nov 24-26 Washington Class Championships, Seattle, WA. Congratulations to Master/Expert section winner Viktors Pupols, still strong after all those years! See report from TD Gary Dorfner. See games page. Nick Raptis was in his usual form at the Portland CC November G/60, winning with a perfect score of 4.0. Daniel Gay finished second with 3.5 points. Congratulations to Portland Fall Open co-champions Chuck Schulien and Landon Brownell, with 4.0/5.0. Chuck recently returned to Portland from New York City. We also note that Steve Surak won the PCC October G/60 event with a perfect 4.0 score! Nice job! Tacoma Chess Club Puget Sound Open and Old Timers Day Oct 21-22 at Freighthouse Square near the Tacoma Dome. Congratulations to open section winner Allen Smith! GM Slugfest in Bellevue, WA. See article in The Seattle Times, October 11, Section F, or see www.gmslugfest.com. Also see USCF article featuring this event. Congratulations to Spokane Fall Championship 1st Overall, Phil Weyland, with 4.5 points. Seattle Fall Open was held September 22-24. See Eastern WA Open results on Spokane Chess Club website. Oregon Open (Sep 2-4) at Mt. Hood Community College in Gresham, OR. Chess Classic Mainz tournament held August 15-20 in Germany – This annual event is among the very best chess tournaments in the world, and also includes a Chess960 competition. See USCF World News: Anand, Aronian Winners in Mainz; Kasparov and Karpov Share First in Blitz Exhibition. Also see information and news at www.chesstigers.de. US Open Chess Championship concluded August 13 in Oak Brook, IL near Chicago. See http://www.uschess.org/tournaments/2006/usopen/ for more information. Congratulations to Blake Phillips, winner of the Portland Chess Club July G/60 event, with a score of 3.5/4.0. Congratulations to Nat Koons, winner of the Seattle Chess Club's Seafair Open (July 28-30), with a perfect score of 5.0! Congratulations to Portland Summer Open winners Nick Raptis and Blake Phillips (Open section, 4.0/5.0 each), and Ezekiel Smigel (Reserve section, 4.5/5.0). This event was held July 15-16, the same weekend that marked the start of a Chess 960 event at the UW in Seattle. See the TA page for details of the Chess 960 event! 3rd John Anderson Memorial Quads in Spokane – Zach Countryman won Group "A" with 5.0. Ben Blue and Ward Chow won Group "B" with 4.0 each. The Washington Open was held May 27-29 in Everett, WA. See some news about the event from the British Columbia perspective. USCF News: 1,962 Elementary Chess Competitors Battled in Denver For National Titles. Oregon Class Championships held May 6-7 in Eugene, OR. Oregon Scholastic Chess Federation (OSCF) Championship: Grand Champion, 16-year-old Corbin Yu of Lake Oswego received a $1,000 savings bond. Corbin had a perfect score of 4 out of 4 games in the Open Division of the Varsity Section. A significant accomplishment since, with a rating of 1813, Corbin went up against players who were older and rated significantly higher. Photo: Raleigh Foster (left) vs. Corbin Yu (right). Additional photos/comments on www.oscf.org. See the story on Oregon Live. The ODLE Middle School won 1st place in the National Junior High (K-9) Championship April 7-9 in Louisville, Kentucky. This is the first time a school from WA State won the national championship team title in this event. (Stevenson won the national K-5 championship team title last year.) ODLE team members include Calvin Chan, Alex Guo, Michael Lee, Jerry Li, and Ernest So. Congratulations! WA State Elementary Chess Championships held April 8 in Kennewick, WA. 1,014 players and 192 different teams from around Washington State were represented this year! Results can be found on the WHSCA website: http://whsca.org/ElementaryState2006.html. Results from the Spokane March Madness event: 1st Overall with 3.0 each were David Griffin & Ron Weyland. Each earned $25. Best U/1500 Ted Baker with 2.0 earned $20. Congratulations to Karen Marcjan, who won the Susan Polgar Qualifier held Mar 18th in Olympia. Karen will represent Washington in Chicago in August. Nat Koons was supposed to take on all comers Saturday 3/11 at the inaugural Seattle Chess Club Monthly Blitz tournament. (See the Feb. issue of Northwest Chess for more info.) The Tacoma Chess Club also held its Northwest Open tournament 3/11-12. Report on Oregon State Chess for Success Tournament from The Oregonian. WA Chess Championship! – The Washington State Chess Championship and Premier concluded on Monday, February 20 in Tacoma. Defending champion Slava Mikhailuk won the championship section with 7 points, while Ignacio Perez won the Premier with a very impressive score of 8 (out of 9). See previous story in the Tacoma News Tribune. See the list of Washington State Chess Champions, 1862 to date. OR Chess Championship! The Oregon Chess Championship also concluded on February 20 in McMinnville. Defending co-champion Oleg Zaikov won the championship with a very impressive score of 8.5 (out of 9), drawing only with Landon Brownell, who finished a close second with a score of 8. See the list of Oregon State Chess Champions, 1961 to date. OR Junior Championship! Congratulations to winner Raleigh Foster with a score of 4.0 out of 5. The other players, in order of finish, were Blake Phillips (3.5), Daniel Gay (2.5), Ethan Peake (2.5), Blake Salisbury (2.5), and Drew Serres (0). John Julian won his second straight Spokane Club Championship and Spokane Winter championship with a score of 4.5. His only draw came to the second seed, Pat Herbers, who finished second overall in the event with a score of 4.0. 36 Oregon 5-player scholastic chess teams competed in a team-against-team chess event at Cottage Grove High School in Cottage Grove, Oregon, Feb. 24-25, 2006. 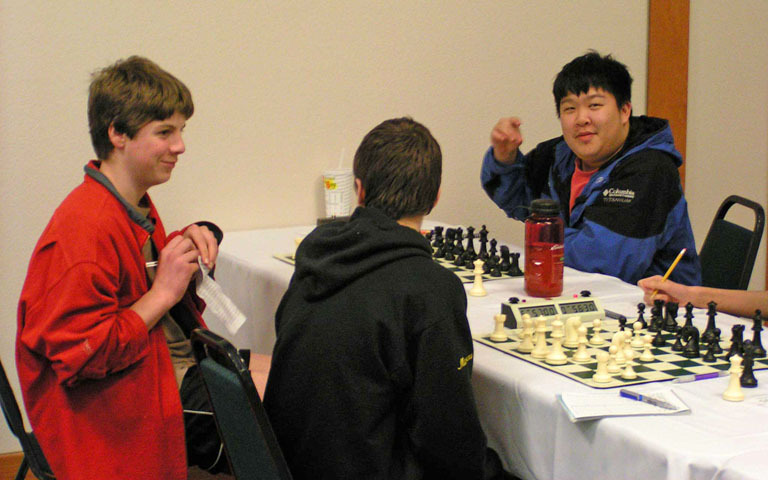 The event was sponsored by the Oregon High School Chess Teams Association (OHSCTA). For more information, visit http://ohscta.tripod.com. Pierce County Chess League ran for 5 consecutive Friday evenings (2/3 to 3/3) at the Tacoma Chess Club. Six three-player teams competed. Congratulations to 1st place team, the Warriors, with team members Paul Bartron, Collin Wisdom and Charles Cordy. Eric Woro won the Tacoma Chess Club U/1800 tournament held February 11-12. The 2005-06 TAPCO (Tacoma scholastic) season is over. There were 8 schools and 10 teams this year. Congratulations to the Charles Wright "A Team," which finished in 1st place with 31 points. Elliott Neff reports that "The NW Grade Level Championships concluded on Jan. 28. With about 460 players competing by grade level, and an added section for 7-8 players, competition was at a high level." See the results on the WHSCA website. Challengers Cup/Seattle City Championship at the Seattle Chess Club, January 13-15. Gresham Open – Jan 7-8, 2006. Congratulations to winner Drew Serres, with 4.5 out of 5! !